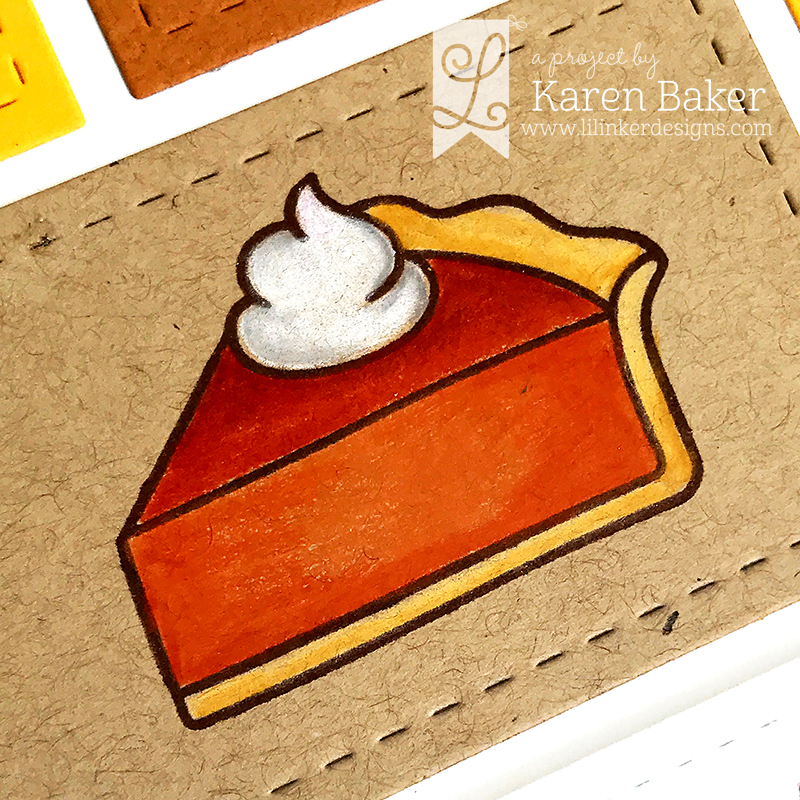 To all that celebrated Thanksgiving a few days ago, did you enjoy a slice of pumpkin pie? 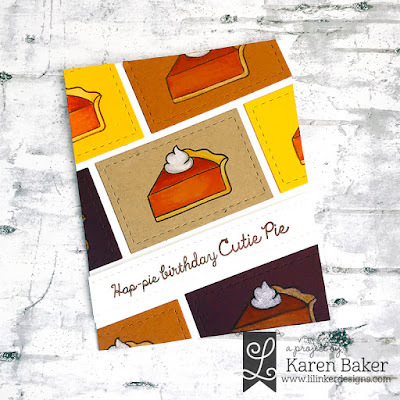 I absolutely adore this set from Lil' Inker Designs, Hap-pie Thanksgiving Stamps, along with the coordinating dies, the Pie Die Set. 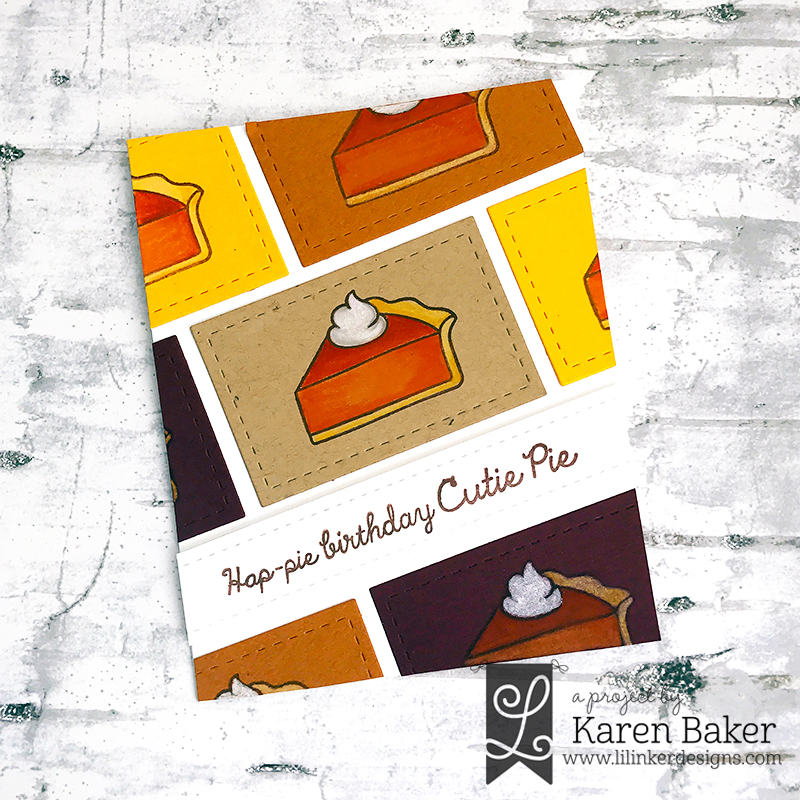 I wanted to showcase another way to use this set beyond Thanksgiving so I created a birthday card! And I wanted to share again this fantastic sale going on! Everything is 30% off including the October release! There is also a BIG 50% off category to shop as well. 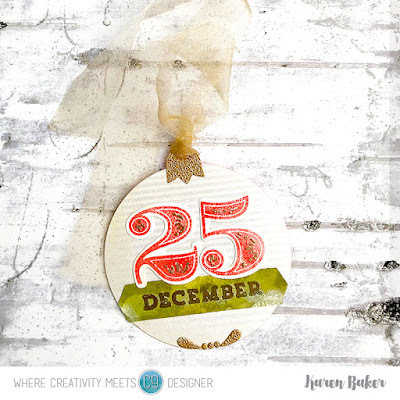 I’m really excited and honored to be here today with Lil' Inker Designs as part of 2018's 25 Days of Christmas Tags, hosted by the the kind and creative Tracey McNeely! 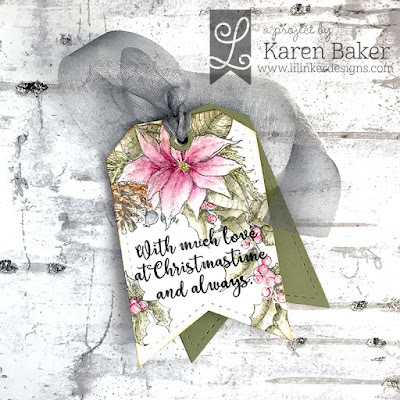 I couldn't resist the chance to again use the Classic Christmas Stamp Set that was released last month to create my tag. First, I die cut two tags from the Anytime Tags Die Set 2, and then stamped the arrangement from Classic Christmas onto the front tag. I colored the images with zig markers and then finished with a sentiment from that same set and some sheer ribbon. Along with amazing inspiration in the form of gift-giving tags for the holidays, you also get a chance to win from these amazing sponsors! Please find all the details on Tracey's blog. 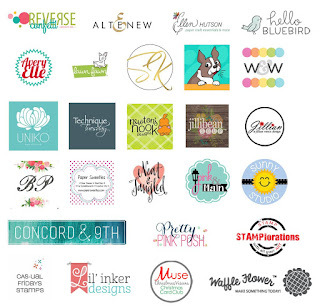 Also, I wanted to mention the AMAZING sale Lil' Inker Designs is having for Black Friday! I had some free time this weekend to just play! 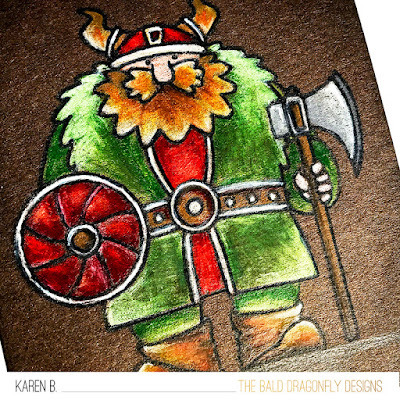 I had the Viking Stamp from MFT for well over a year now, unused, and decided it was time to bring it out and get it inky. I used the MFT Color Challenge #105 and MFT Sketch Challenge #411 as my inspiration. He was stamped in dark brown ink onto chocolate cardstock and colored with PrismaColor colored pencils, with a few white gel pen details. I used the Trail Mix Patterned Paper Pack (I think it is retired?) 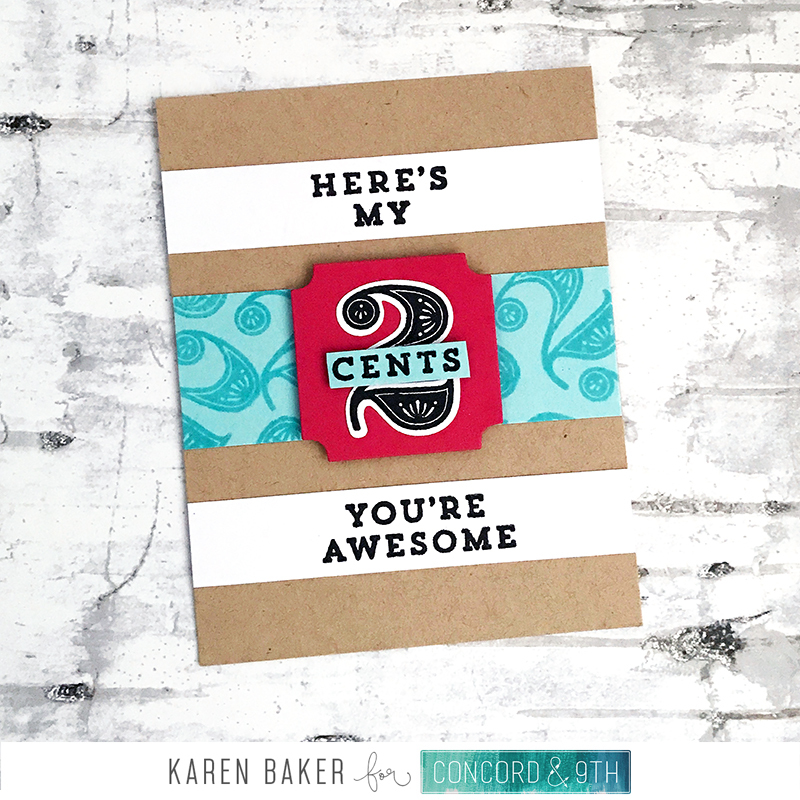 for a few strips on top, and finished with a sentiment from Essential Sentiments. A cute and fun play on words, in my opinion! I can give this out to a person with a sense of humour, or a guy who needs a bit of a pick me up. Just popping by quickly to showcase a card I made for a dear friend and her new husband that will actually will be going in the mail. Ok, ok, I will be honest. It is two months late, but at least it is the thought that counts? 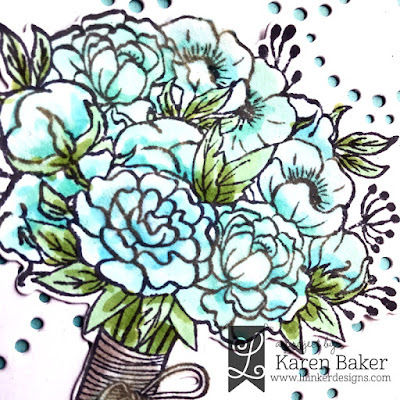 I started the card with a light blue card base. Onto a white cardstock panel I die cut the beautiful Cover Up Die: Dotted Scallops from Lil' Inker Designs. I love the subtle variance in each of the cut out dot shapes! I adhered the panel onto the blue card base and then moved onto the focal elements of the card. 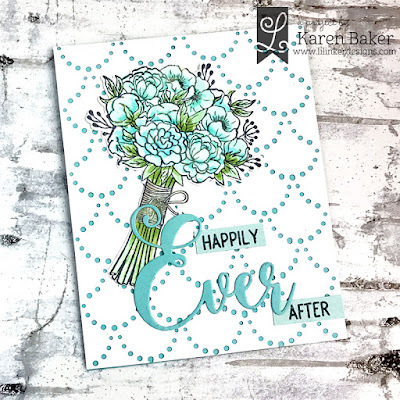 I stamped the bouquet from Bouquet of Roses, die cut it with the corresponding die set, and colored it with copics and a shimmer pen. I finished the card with a die cut from the Ever Word Die and stamped sentiment from the Ever Stamps. Lil' Inker Designs has something really great planned for Black Friday, stay tuned! Spellbinders is offering some select clear stamps and so kindly sent me a few sets to play with. Floral Love is beautiful! 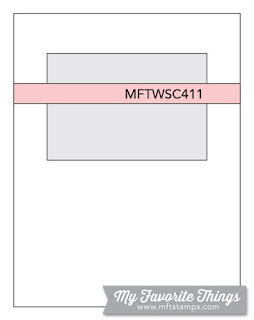 The above card uses it in a toile fashion. 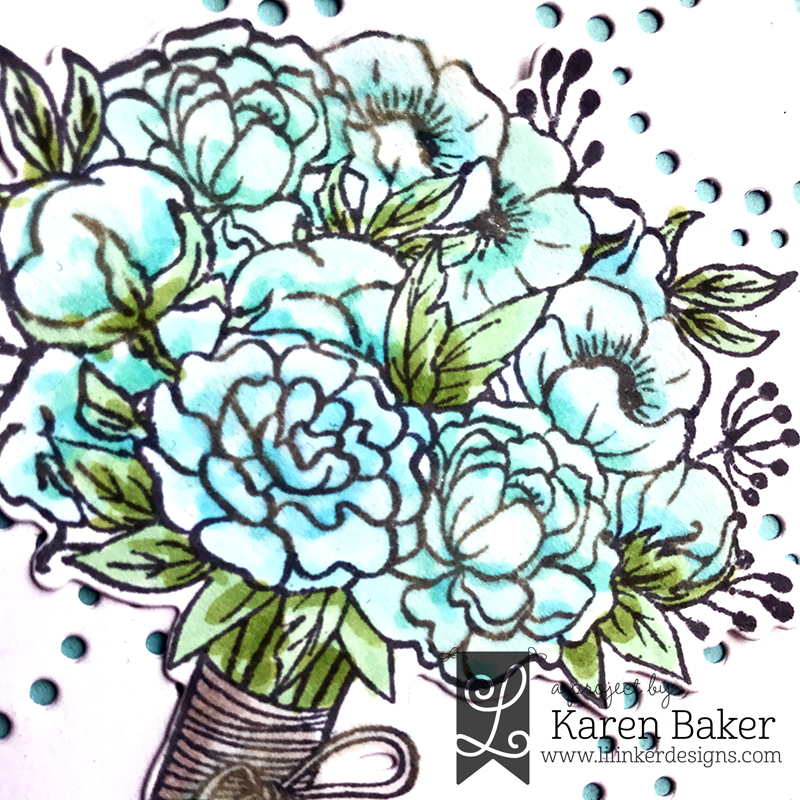 I stamped the florals onto blue cardstock with blue ink, and then a top portion of the card base in the same fashion. 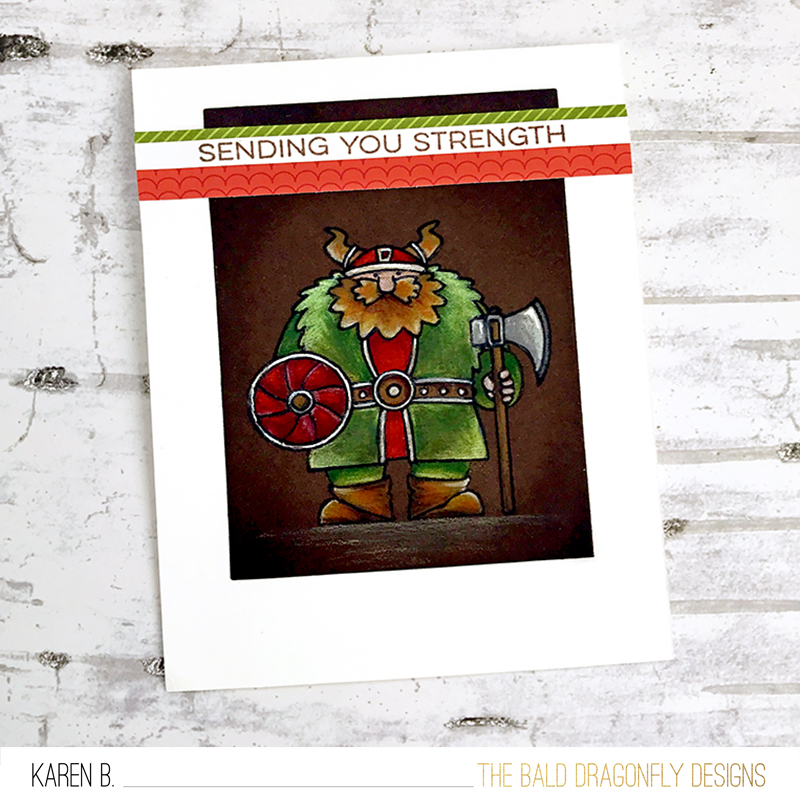 I finished the card with a sentiment from the same set. 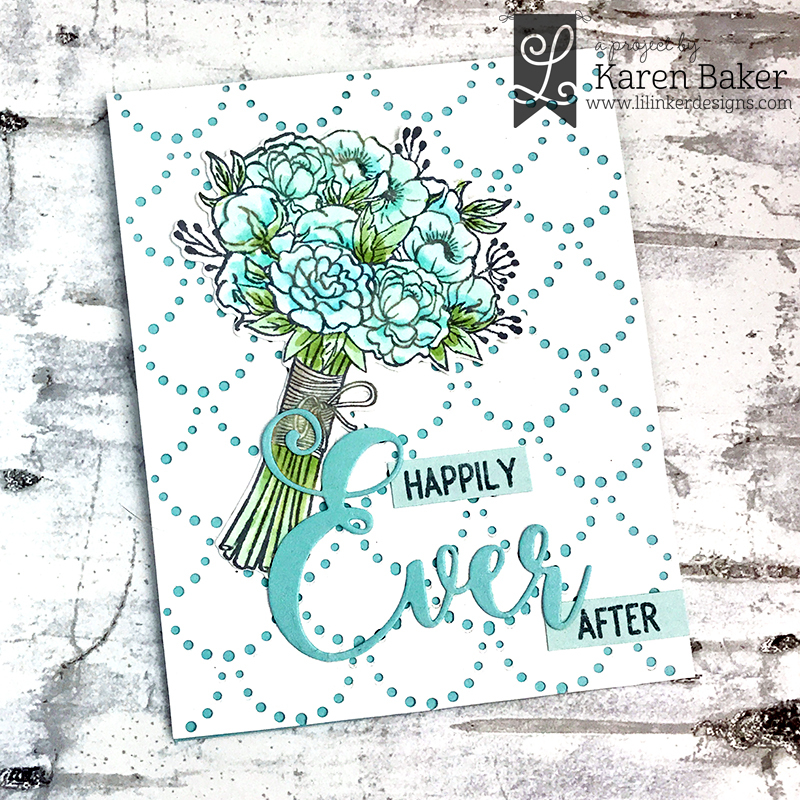 The above card features Floral Love again, this time stamped in brown ink and colored with Zigs. I added some splatter and a sentiment from Family Sentiments. 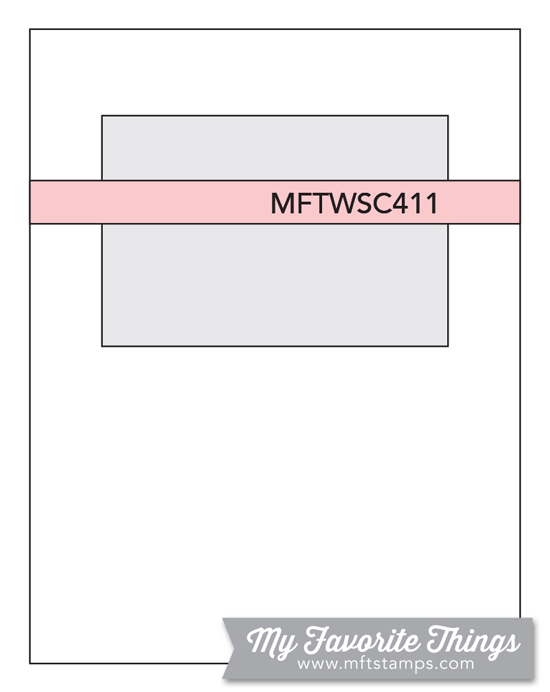 I finished the card with a custom dashed border. 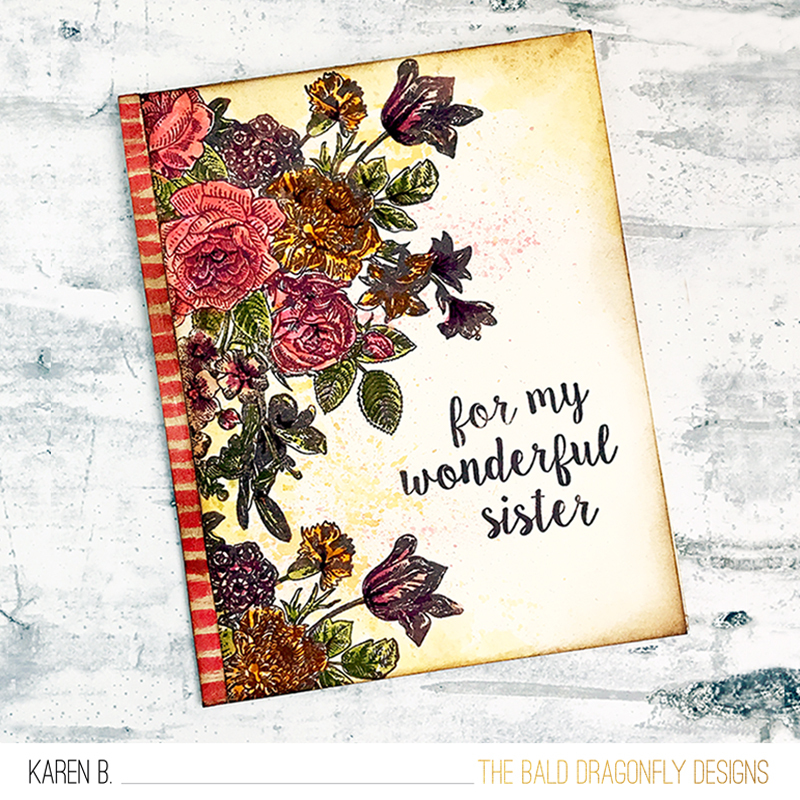 These sets from Spellbinders are a lot of fun, and so exciting to see a great company expanding their line! The Hollies & Berries Cover Plate Die, part of the All the Trimmings Bundle released from Catherine Pooler Designs (affiliate links used), really can create a punch on a card! 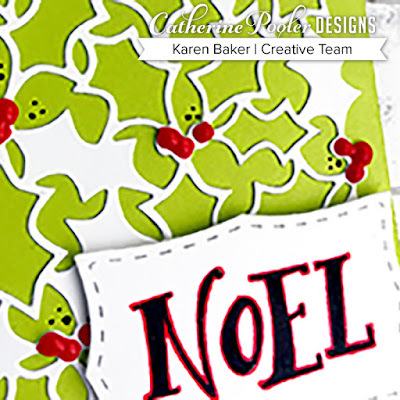 For this CAS card, I cut the cover plate from white cardstock and adhered it on top of a lime green card base. I then used Nuvo Drops in red to form the berries and then for extra embellishment, doodled some black dots near the berries. I finished with a sentiment panel created from Seasonal Sentiments & Borders Set and the Nested Labels Dies. I’m really excited and honored to be here today with Concord & 9th as part of 2018's 25 Days of Christmas Tags, hosted by the the kind and creative Tracey McNeely ! Along with amazing inspiration in the form of gift-giving tags for the holidays, you also get a chance to win from these amazing sponsors! 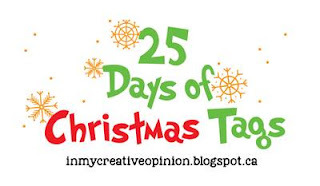 My tag above uses absolutely no holiday geared stamp sets, rather, I creatively used stamps and dies from the Notable Numbers Stamp Set, All Seasons Turnabout Stamp Set, Notable Number Dies, and All Season Dies. Some platinum embossing powder and opal mouse finished the look! I have the pleasure to showcase the last of Concord & 9th October Release today! 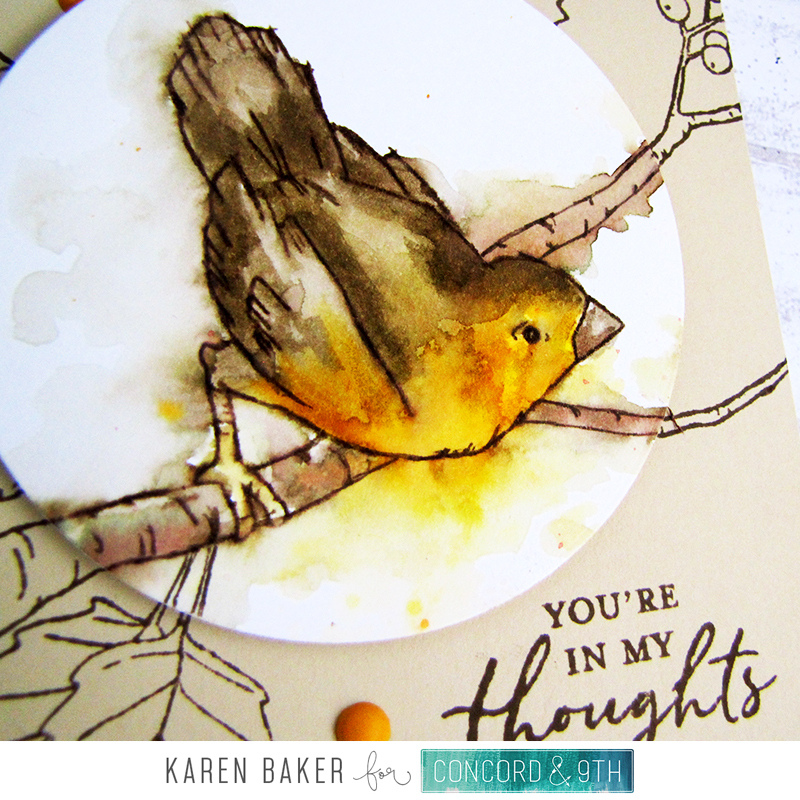 The Crafty Turnabout Bundle is perfect for us cardmakers, it was made to fit us to a T! 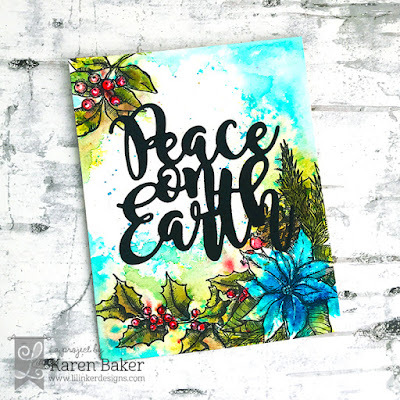 For my first card, I used the Crafty Turnabout Stamp, stamping in shades of blues, yellows and greens. 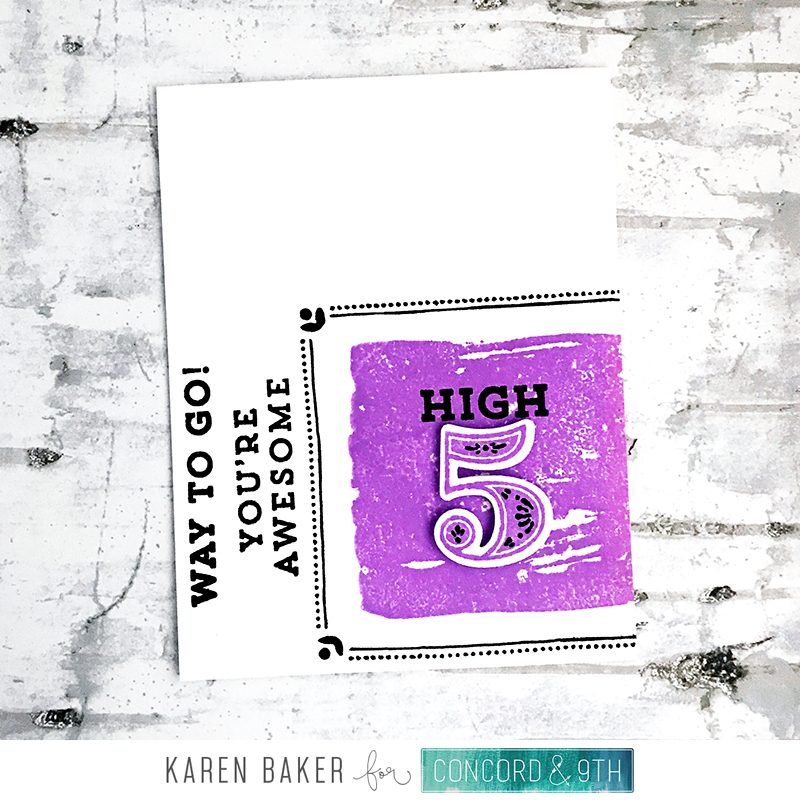 I finished the card with a die cut of a stamp, created from the Crafty Dies, some floss and a sentiment. 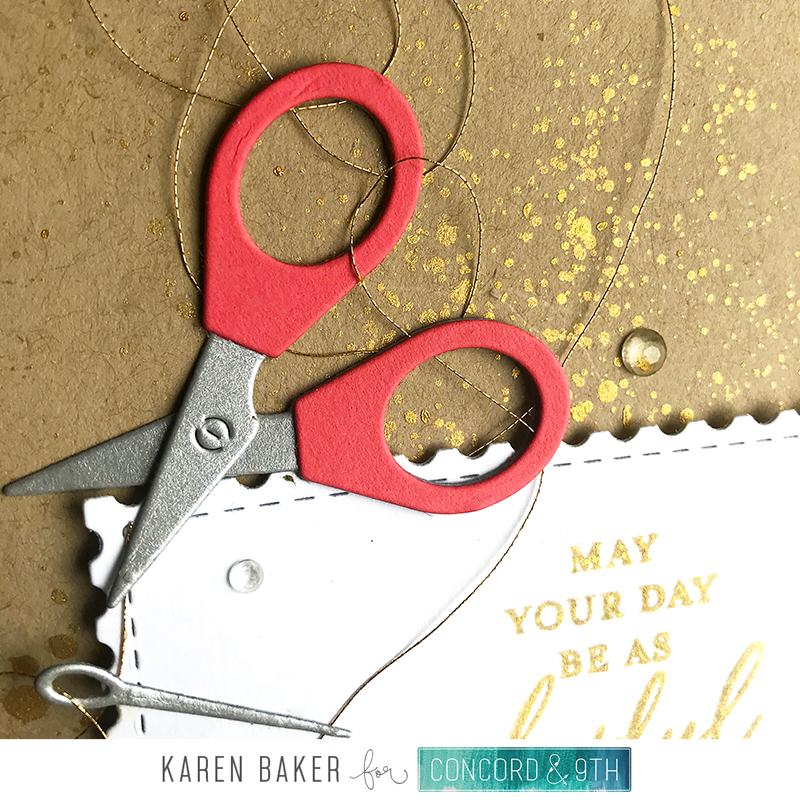 This next card uses the Crafty Dies...how cute are these scissors and needle?! 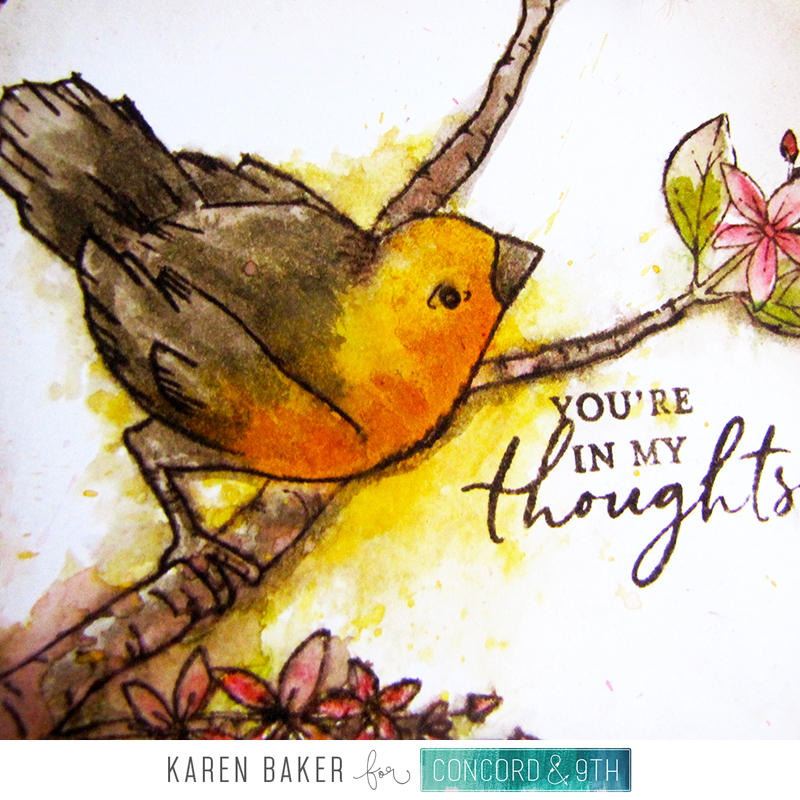 I added some gold thread, gold splatters and a sentiment from Songbird. 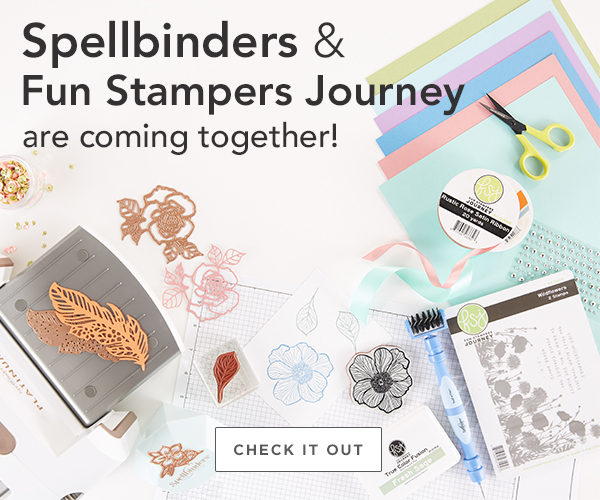 Fun Stampers Journey and Spellbinders are coming together today, November 1st 2018! I am honored to help spread the love for this merger with two fun cards. Did you know that FSJ stamps are made in the USA of deeply etched red rubber for a perfect impression every time? Or their thin metal dies are made of steel to give you clean cuts time and time again, without warping or dulling? And, they’re coated in FSJ green so they're easy to find! Spellbinders offers over 50 exclusive colors – matching cardstock, ink, ribbon and accessories makes creating easy, and finally, over 50% of thier stamps have coordinating dies – no more fussy cutting!?! My first card, the acorn card, features the set Thankful Friends Stamp Set and dies. 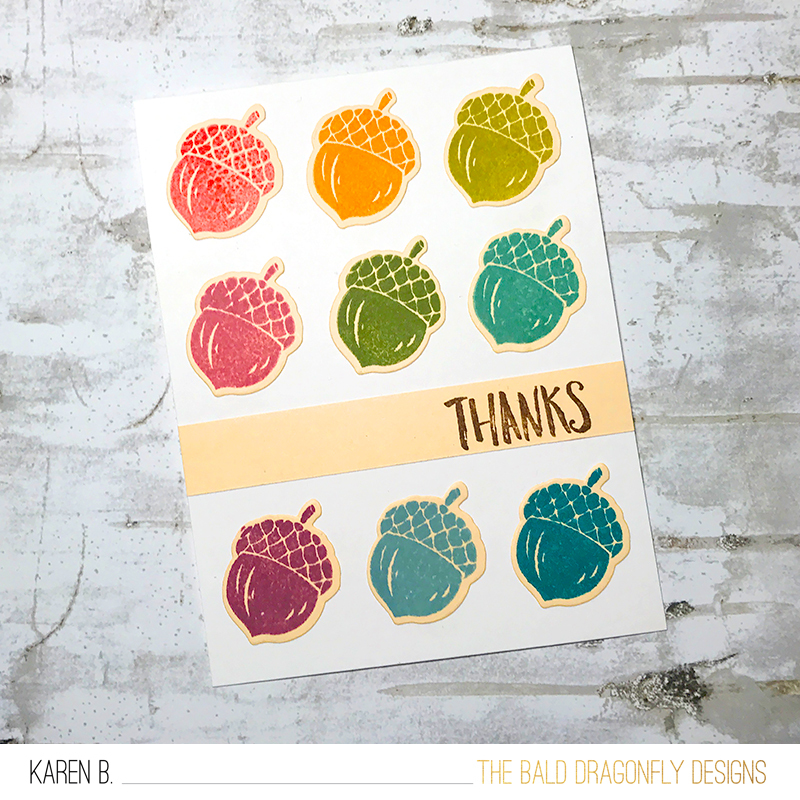 I thought it was fun to have a rainbow array of the acorn, arranged in a clean pattern. I finished the card with a partially stamped sentiment, also from Thankful Friends Stamp Set. My next card features the regal fox included in the Thankful Friends Stamp Set which was die cut with the corresponding dies. I laid him atop of a stamped bed of leaves, and an inked sunset. 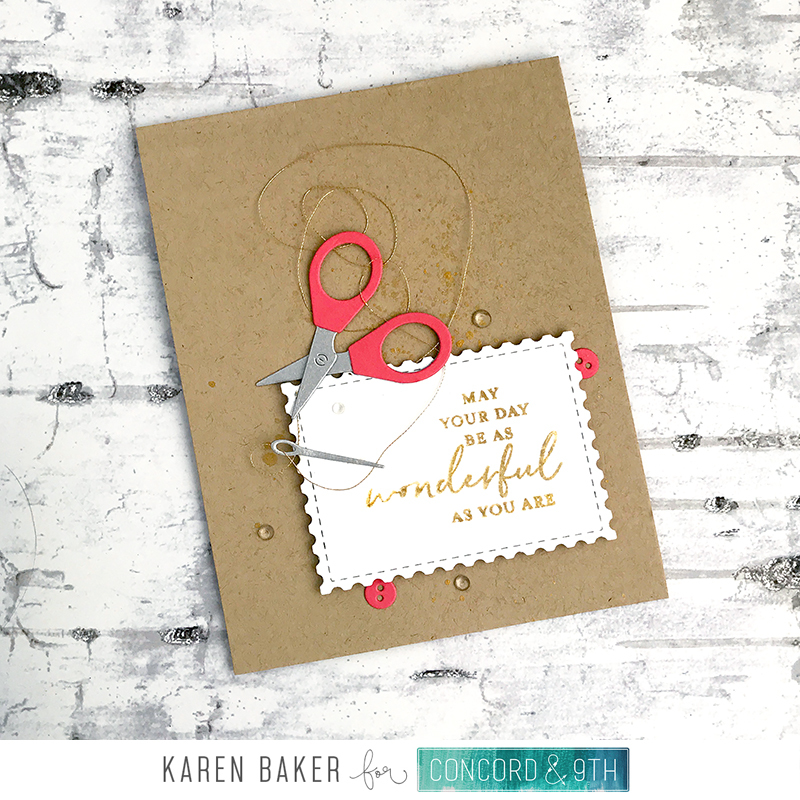 I finished the card with a sentiment from Thankful Friends Stamp Set and the fun adhesive, Holiday Sparkles. 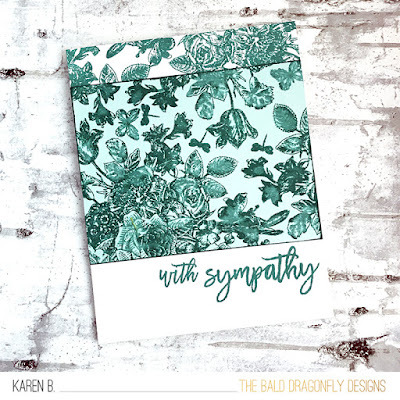 I hope you have a chance to check out this new, fun collaboration, and I know you will have as much fun creating with them as I did! 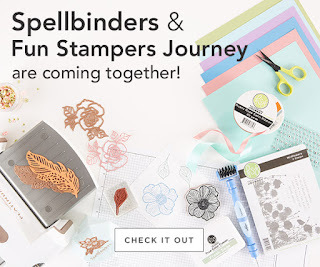 Thank you, Spellbinders and FSJ for letting me in on the fun!